In my last blog I mentioned Dunsmuir Railroad Days and the Baldwin Locomotive Works 2-6-0 Mogul I saw in Globe, Arizona. Well, 2 weekends ago we went to Dunsmuir, CA to see one of the sister 2-6-0 Moguls, Southern Pacific #1727, and to see what their Railroad Days (June 10 – 12, 2011) had to offer. Locomotive 1727 is a class M-6 Mogul built by Baldwin Locomotive Works in 1901. 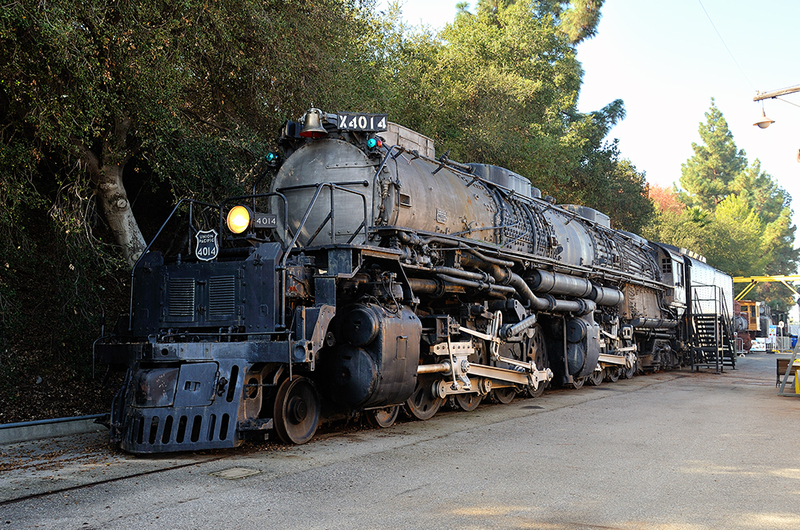 It served Southern Pacific in California and Oregon until 1956. 1727 is one of only 7 Mogul engines surviving today out of 355 originally built. There were four privately-owned passenger cars available to be toured. These were powered by Amtrak 190, a P42DC GENESIS locomotive. The Tioga Pass (built as a Canadian National business car for railroad executives in 1959) and the Silver Splendor (built as a stainless steel Vista-Dome coach for Chicago, Burlington & Quincy in 1956) can be booked for one of their public trips or for private charter through www.larail.com. The Silver Solarium and Silver Lariat were both built as Vista-Dome coaches for the California Zephyr in 1948. They can be booked for one of their public trips or for private charter through www.CalZephyrRailcar.com. These cars were part of a round-trip excursion trip from the Bay Area to Dunsmuir, as well as an excursion Saturday afternoon to Black Butte and back to Dunsmuir. More information on this and other excursions can be had by visiting: Trains & Travel International. If this makes you wish you had a California Zephyr train on your layout you may be interested in some HO scale passenger cars from the now out-of-business International Hobby Corp. Once this stock is gone it will likely be unavailable in the future. One of the coolest things about Dunsmuir and its Railroad Days is they have a working turntable. They even gave rides on the turntable every hour! I uploaded a video of my turn riding the turntable on YouTube here: Taking a ride on the turntable at Dunsmuir Railroad Days 2011. And here’s a short video of them locking the turntable into place: Locking the Dunsmuir, CA turntable during Dunsmuir Railroad Days 2011. Union Pacific generously brought out the 1996 Heritage SD70ACe painted in commemorative Southern Pacific-inspired colors and some of the other displayed rolling stock for the event. If you are wishing you had one of these locomotives for your N-scale layout you’re in luck! We just got one of these back in stock: Kato N – UP (SP Heritage) EMD SD70ACe Diesel Locmotive. Soon after I took the above picture, a Union Pacific freight train entered the town for a crew change. I took a video of this train as it left town southbound and added that to our YouTube page as well: Union Pacific southbound leaving Dunsmuir after crew change during Dunsmuir Railroad Days 2011. This train was being pulled by 1 ES44AC and 2 SD70Ms and bringing up the rear were 2 ES 44ACs. 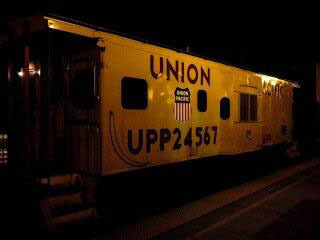 Below you can see the UP train parked in front of the Amtrak Depot. In the same building you can find the Dunsmuir Railroad Depot Historical Society. Another non-profit with a presence at the fair included The Shasta Cascade Rail Preservation Society. Did you know that Dunsmuir was originally named Pusher for the ‘pusher’ or helper locomotives that assisted trains over the steep grades to the north? Well if not, now you do! After Alexander Dunsmuir came to the town of Pusher and fell in love with it, he promised the inhabitants that he would build them a fountain if they would name the town after him. He did and they did and the fountain (and town name) are still there today! Below you will find a mural highlighting some of the features of Dunsmuir-living which prominently include the railroad, Mt. Shasta, and fishing in the Sacramento River. This mural was designed by John Signor, prolific author of many railroad books including Southern Pacific’s Shasta Division: Over a Century of Railroading in the Shadow of Mt. Shasta. There were also 3 cabooses on display. 2 were UP cupola cabooses including the one pictured below. If you are looking for some similar ones for your layout we currently have in stock just 1 HO Athearn kit left of a UP Cupola Caboose. Then there was this Western Pacific Bay Window caboose from the Western Pacific Railroad Museum. Developed in the 1920s, Bay Windows allowed for a safer way to look ahead at the train and monitor for equipment problems than the Cupola. Located in Portola, CA this museum and the related Western Pacific Railroad Historical Society are a great place to visit. You can even arrange to operate locomotives! We don’t have any WP Bay Window cabooses in stock but we do have an HO Union Pacific Athearn blue box kit with 3 bay window cabooses. Once these old blue box kits are gone they are G.O.N.E. So, first come first served! In addition to the plethora of life-sized train equipment, one of the local model train clubs was showing off their layout too. Below you can see part of the permanent layout of the Dunsmuir & Cedar Flats Model Railroad Club. Last Saturday was National Train Day, a holiday started in 2008 by Amtrak to celebrate the completion of the first transcontinental railroad. The golden spike was driven home on May 10th 1869 in Promontory, Utah connecting the Union Pacific and Central Pacific railroads. Although the holiday was initiated by Amtrak, all sorts of railroad museums, model railroad clubs, railfans, and model railroad retailers celebrate with events across the country. This year we did our celebrating by being a part of the Rickreall Model Train Swapmeet & Show just west of Salem, Oregon hosted by the Polk Station Rail Model Train Club. This club was founded in 1993 and features an HO scale layout which is permanently housed in a large upstairs room of the historic Rickreall Grange Hall. The subject of their layout is the Oregonian Railroad which was a narrow gauge railroad that ran through Polk Station to Dallas, Oregon until Southern Pacific acquired the line in 1890 which removed the narrow gauge and replaced it with standard gauge. The layout is quite large and has great use of light and sound. Below you will find just a couple of shots, one includes the Tim Burr logging truck from Woodland Scenics. One of the best things about participating in train shows is meeting other vendors with unique items we haven’t seen before. This show gave us a few opportunities to meet such folks. First, we met Dave one of our ‘table neighbors’ upstairs. He does custom modeling and scratch building of HO vehicles and equipment. He displays and sells some of his already completed projects and takes on custom projects for customers looking for items that are not already available in the marketplace. Although he mostly works in HO scale, he is not vehemently opposed to doing projects in O or N scale. “If you can imagine it, I can build it,” he says. Dave can be reached at dgeo59@hotmail.com or 503-442-0140. Another unique vendor we met this show was photographer, Laurie Breier. Laurie’s collection of photography is called Graffiti Artistry and it provides a unique view of railcars acting as the canvas to graffiti’s paint. Railroad graffiti is its own subculture which Laurie captures as striking images framed and ready to display. The subject inspires conversation about topics such as the history of ‘graffiti’ on trains back to the days of hobo codes, what is art, and how has graffiti affected railroads, railfans, and modeling. Laurie can be reached at wkndrs@cmspan.net. We attended the Great Train Expo in Pomona, December 18th & 19th, despite the torrential downpour that turned Los Angeles into a rather large puddle a week before Christmas. Attendance was likely diminished due to the historic rainfall (this is the third wettest December since they started keeping track in 1877) but it was a successful show despite it, and Don and his son Alan (who helped out in my stead) met some fine Southern Californian train folks. We spent the holiday down in So Cal where our respective families still reside. I was given a tour of the Haigler Creek & Western Railroad, my dad’s N-scale layout which is under construction, and took some pictures. Below you can see the roundhouse and turntable in the foreground of this photo with my dad inspecting some track in the back section. All of these switches work and the lights light up! It’s quite something. Here you can see some, just some… of the detailed wiring involved in the Haigler Creek & Western Railroad. You can also see some washers used as counterbalances for the coal mechanisms. On the way back home we took a spur of the moment jaunt into Dunsmuir, CA. Just as we pulled into town, so did a Union Pacific train coming from the south. Don quickly navigated us down to the tracks and I jumped out to wave at the engineer and snapped this photo of the GE ES44AC and accompanying video in the nick of time. I’ve been through Dunsmuir at least 8 times before while traveling on Amtrak’s Coast Starlight but as the schedule always puts the train there in the dark of night I’ve never seen the town properly before. Our plan is to go back and spend a day there since it is only a 2-hour drive from Merlin, OR. Happy new year to all and happy railroading!